Did you know that the monitor setup is an important factor when it comes to trading? In fact, the setup that you use may have a huge influence on the way that you analyze the markets and the way you trade the markets. And you know what, this is as relevant to swing trading, as it is to day trading. You should consider your monitor setup regardless if you make long term trades or short term trades. If you don’t know how much screens you should buy, where should you put those screens, or even the best size to choose, just stick with this article. Let’s check all the details, one by one, and decide what’s the best way to build your trading monitor setup. We often see those facebook traders and internet traders in pictures or videos with a huge number of monitors. They put everything they have on the desk. Their desktop and 4, 6 or 8 screens. Then they also join the big TV that they have on the living room on one side, and the bedroom TV on the other side. They borrow their wife’s laptop and all the old dead laptops that they find at home. They steal their son and daughter tablets. Everything that has a screen is valid for the picture. And if you add two smartphones, then you have the complete set! When you look at it, it seems like a Christmas tree. One of the screens has a Bloomberg or CNBC TV going on so that they become aware of all the news and analysis from the experts. At the same time, they also have one screen with the forex factory calendar, just in case the TV transmissions don’t cover all the news. Well, I guess you saw a lot of those around over the internet, right? Do you really need one of those setups to be a profitable trader? You know what, for a long time, when I was a beginner trader, I wish I could build an office like that. A big wall, full of six, eight, ten screens! But then I started to investigate the subject. Reading everything that I could. Not just about how to build a trading monitor setup, you have a huge amount of articles about that over the internet. But also about science and psychology, and what they say about one of the most important things when it becomes to trading, your focus! There’s a book from Daniel Goleman, “Focus”. I recommend that you read this book, although there are several other good books about the focus on trading. Nowadays the experts talk about the focus that each person can deliver to a specific task. The efficiency of our focus is very small, did you know about that? After 30-40 minutes, doing a task, or a mental exercise, our focus starts to ramble and increases with time. When we begin a task we don’t have a big initial focus. But as we continue, our focus starts to rise, until it makes a peak of productivity. This usually takes some minutes to occur, but it depends from people to people. At this point, we forget everything that is happening around us and are completely focused on our task. This is an expensive activity when we think in terms of energy. 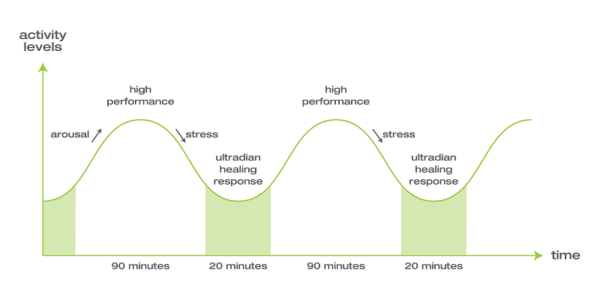 Our brain heats up, it has a peak of energy, and then that energy comes down again. This means that if you have four, six, eight screens in front of you, that will not help you, that will just disturb your attention. So, how much monitors do I need to be able to trade in an efficient way? Well, try to look with your eyes to two different places, two different screens. We can only put our focus on one thing at a time, one trade at a time. What’s the biggest problem of having a wall filled with screens? And that excess will end up distracting you, spreading your focus over everywhere. And you will lose your attention on what really matters, that is to make the best decisions regarding your trades. How many screens do I use nowadays? In my office, I use two, and I’ll explain to you why. When it comes to short term trading, there are some times of the day when the markets are choppy and don’t really move or show accurate signals. I’m usually not trading during those periods. So, I use that time to do other things that I love, like coding! I’m currently developing machine learning and artificial intelligence systems to trade the markets and sometimes I use that choppy markets time to code. Using the two monitor setup I can use one of them to code, and from time to time, I just take a quick look to my trading charts, just to check if the market price made an interesting move that’s worthy of attention. But when that happens, I just focus on my trading monitor and forget about everything else that I could be doing. I only need one screen to trade! One more screen to trade may help? It may, but no more than two. 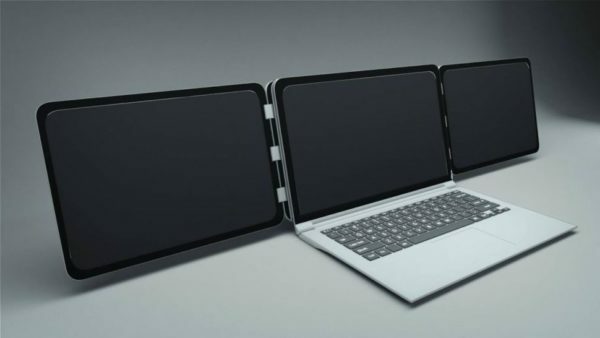 More than two screens will not help you for sure. What about the size of the screen? One of the most important things in the 21st century is mobility! I love to travel and I do it very often. I guess that you love to travel too. What about if you could travel the whole year, and take your job with you? You should try it, as it makes you feel completely free, is amazing! I’m very often trading or running my trading classes from almost anywhere in the world. You can trade while you travel too. 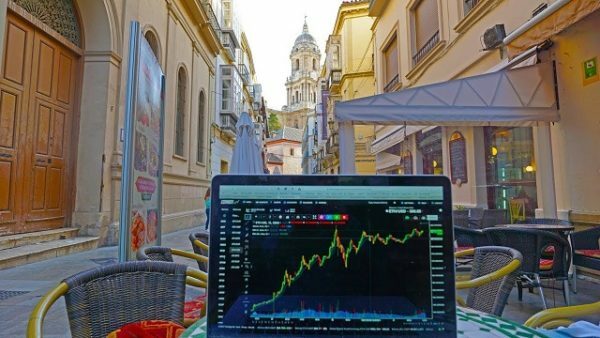 You just need to take your laptop with you and you have all you need to work (yes, trading is a job!). For this reason, I encourage everyone to get used to trading on their laptop screen. If you are used to trading with a big screen on your desk, when you move to your laptop screen, you’ll feel things differently. The charts will look different, you’ll probably need to arrange your trading desktop in a more compact way. This will make you feel some discomfort. And you want to feel comfortable while trading. So my advice, if you plan to travel or often trade outside of your office, just get used to trading on your laptop screen. That way you’ll always feel comfortable trading anywhere. 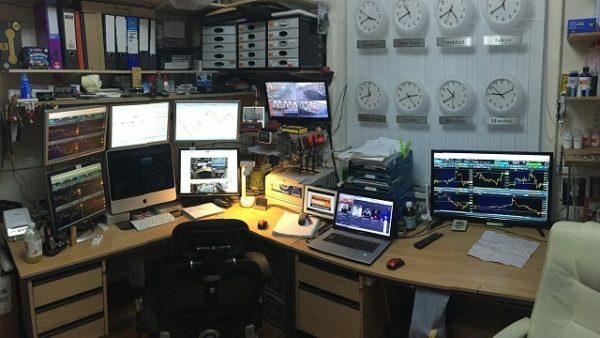 So, why do all the internet trading gurus use a lot of monitors? Just because that way, it appears that what they do is very complex. They feel superior doing that. Well, they have actually no idea about what they are doing. And that will definitely not help you. You need the biggest focus and attention possible during that time. Distracting you from what really matters. What really matters are not all those lights blinking on all the screens. What really matters are the rules of your trading plan and you analyzing the markets completely focused so that you don’t miss that good trading setup when it appears.